Mascherati dal tempo, le discontinuità nell’istruzione registrate negli anni ’80 aiutano a spiegare perché il costante calo della fertilità si sia arrestato in maniera sorprendente negli anni 2000 in dieci paesi dell’Africa sub-sahariana. I risultati, secondo Endale Kebede, Anne Goujon, Wolfgang Lutz e Nicholas Gailey, sottolineano quanto sia cruciale riconoscere il ruolo dell’istruzione nel moderare la crescita della popolazione e accelerare lo sviluppo socio-economico. The future pace of fertility decline in Sub-Saharan Africa will likely be the chief determinant of world population growth, with massive implications for Africa itself as well as the rest of the world. Sub-Saharan Africa stands out as the world’s last region to enter the demographic transition. It was only in the 1980s that birth rates started to fall in most Sub-Saharan African countries, and still, these declines have been uneven and have stalled at times. Particularly in the late 1990s and early 2000s many of these countries experienced a slowdown of their fertility decline and in some cases even a reversal, the reasons for which have remained largely unexplained (Kebede, Goujon, Lutz 2019). Most existing studies try to link stalls in fertility decline to some specific factors, such as slower socio-economic development (Shapiro and Gebreselassie 2008), the low priority assigned to family planning programs at the beginning of the 21st century (Bongaarts 2008) and other factors related to public and reproductive health. In contrast to the above-mentioned explanations, Goujon, Lutz and Kc (2015) proposed another plausible explanation focusing on cohort effects. They linked the fertility stalls around 2000 to the fact that some cohorts of women were subjected to an education stall, possibly associated with post-independence economic and political turmoil as well as structural adjustment. To explore this hypothesis, we combined individual level data from Demographic and Health Surveys for 18 African countries – with and without fertility stalls – thus creating a pooled dataset of more than 2 million births to some 670,000 women born between 1950 and 1995 by level of education. Our results highlighted that disruptions in educational attainment among cohorts around the 1980s are consistent with populations having higher proportions of poorly educated women of childbearing ages in the late 1990s and early 2000s, than would otherwise have been the case, had educational improvements continued to progress. This phenomenon, coupled with the relatively higher vulnerability of less educated women to period effects, has likely contributed to stalls in the period fertility declines (Kebede, Goujon and Lutz 2019). The post-independence period was a time of great expectations in Sub-Saharan Africa as most countries engaged in a process of expanding social services (Ezenwe 1993). However, the initial period of economic and social optimism was soon replaced by harsher times linked to the external shocks of oil price increases, declining terms of trade, and increasing government external debt (Elbadawi, Ghura and Uwujaren 1992). These changes resulted in austerity measures and massive cuts in government budgets – particularly in the social sectors of health and education – which were mostly in the framework of Structural Adjustment Programs (SAP) introduced in Africa by the Bretton Woods institutions. While it is impossible to say whether the SAP or initial dire situations are behind the slow-down in cohort educational improvement, the children of the 1980s were deprived of educational opportunities, with life-long consequences. 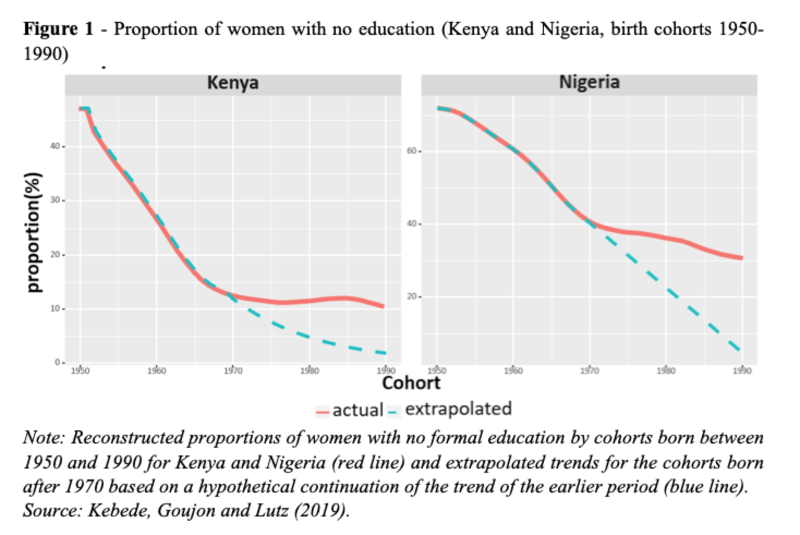 Figure 1 displays the proportions of women who never attended school from the cohorts born between 1950 and 1990 in two populous countries with stalls in their fertility declines (Kenya and Nigeria),. In both countries, the clear trend towards a declining cohort birth rate from 1950 to the 1970s was stopped (Nigeria) or even reversed (Kenya; Figure 2). Such education discontinuities were also observed in most other countries with fertility stalls. 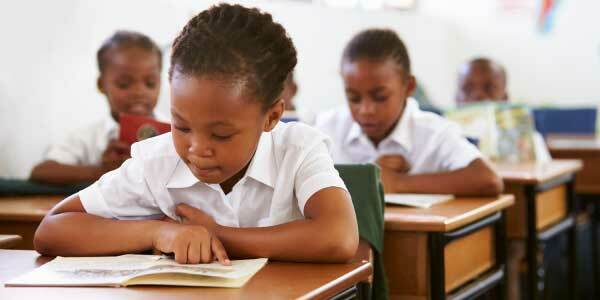 The fertility stalls in Sub-Saharan Africa have rarely, if ever, been linked to the slowdown in educational progress. Indeed, the two phenomena occurred almost two decades apart, which may have seemed too long for any direct causal effects. However, they may be linked by two mechanisms. First, given that education has a direct effect on lowering fertility, the cohorts of girls who were deprived of schooling had higher fertility than they would otherwise have had. Second, period effects on uneducated women around 2000 were more sizable because these women were more numerous than they would have been without the earlier education disruptions. To assess the combined effect of these two different forces, we compared actual fertility trends with a counterfactual, i.e., a hypothetical scenario of what would have happened without this educational stall. This scenario (blue dotted line) refers both to the proportion of women with no formal education (Figure 1) and to the period total fertility rate (Figure 2). The difference between the counterfactual TFRs and the observed ones lies only in the weights given to the three educational groups (no formal education, incomplete primary, and completed primary education or more). Our simulation results show a sizable difference between the actual and counterfactual TFR around the year 2000 in the stalled-fertility countries. In absolute numbers for all ten stalled-fertility countries, between 1995 and 2010, this translates into about 13 million fewer births to women aged 15-34. For Nigeria alone, the difference is about 6.5 million births. The delayed consequences of educational disruptions on fertility levels two decades later have gone largely unnoticed in the scientific literature about Sub-Saharan Africa. An under-appreciation of this connection – between girls’ education and fertility in the following years – could be ruinous for the societies in question, as they attempt to maintain their living standards amid growing demands from prolonged rapid population increases. Shifts toward sustainable fertility and development depend on the reliable expansion of quality education, and accordingly, all relevant initiatives should embrace this as a priority. Bongaarts J (2008) Fertility transitions in developing countries: Progress or stagnation? Studies in family planning, 39(2):105–110. Elbadawi IA, Ghura D, Uwujaren G (1992) World Bank adjustment lending and economic performance in sub-Saharan Africa in the 1980s. Country Economics Department WPS, 1000. Ezenwe U (1993) The African debt crisis and the challenge of development. Intereconomics, 28(1):35–43. Goujon A, Lutz W, Kc S (2015) Education stalls and subsequent stalls in African fertility: A descriptive overview. Demographic Research, 33:1281–1296. 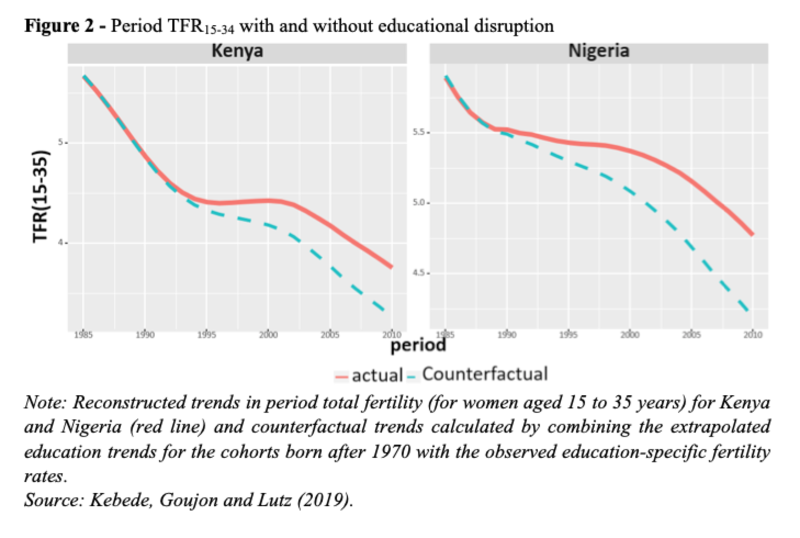 Kebede E, Goujon A, Lutz W (2019) Stalls in Africa’s fertility decline partly result from disruptions in female education. PNAS, Jan 30;201717288. Shapiro D, Gebreselassie T (2008) Fertility transition in sub-Saharan Africa: falling and stalling. African Population Studies, 23(1).